Ok, so this is my 2nd post for mushrooms in a little over a week.. My friend, Amy, tweeted about the recipe below, she found at Food Buzz. So, why two mushroom posts? what does that mean??? Nothing other than the fact that I love me some mushrooms. 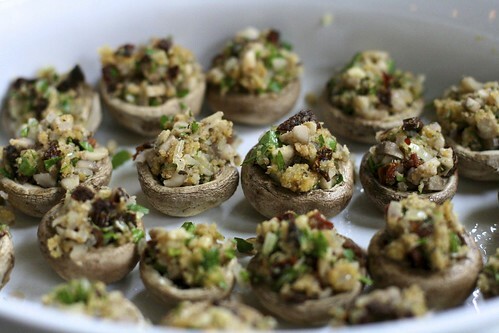 Check out my 1st post, "Slap your Moma Stuffed Mushrooms" here and enjoy my 2nd post below.. In a small bowl, soak tomatoes in hot water to cover 5 minutes. Reserve 1 tablespoon soaking liquid. Drain the tomatoes well and chop fine. Lay mushroom caps, stems removed, face down on baking sheet either lightly sprayed with cooking spray or on parchment paper. Bake approximately 10 minutes, or until their liquid puddles underneath. Remove from oven and carefully pour off the liquid that has gathered in the pan. Carefully turn the mushroom caps over so that they are ready to be filled. In a small skillet, heat oil over moderate heat until hot but not smoking. Cook chopped mushroom stems, shallots, and garlic, stirring until shallots are softened. In a bowl, stir together the mushroom mixture, bread crumbs, tomatoes, reserved soaking liquid, yolk, parsley, basil, and salt and pepper to taste. Mound stuffing in reserved mushroom caps and arranged caps in a lightly greased shallow baking dish. 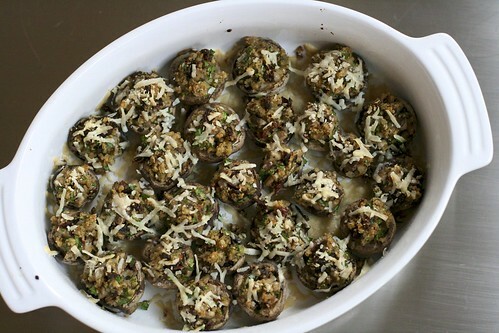 Sprinkle mushrooms with Parmesan and bake in the middle of oven for 15 minutes. I love stuffed mushrooms. This looks like such a great recipe!